This is brand new high quality license plate frame made of metal, not a cheap plastic item. This item is a great statement and perfect gift idea. The lettering and art work are done by waterproof vinyl on the license plate frame and it will last many years without any damage. We provide you the best quality item in the market. It will not get brittle or cracked. If you have any questions about this product by Nicholas Dunlop, contact us by completing and submitting the form below. If you are looking for a specif part number, please include it with your message. 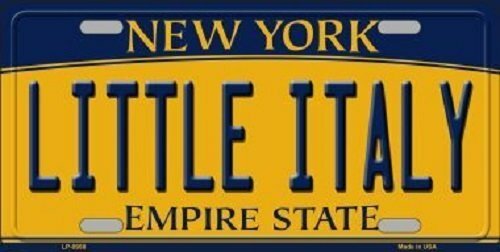 zaeshe3536658 Italian License Plate, Camogli Building Sea Lamp and Balcony Tourist Spot in Ligury Italy Print, High Gloss Aluminum Novelty Plate, 6 X 12 Inches. zaeshe3536658 Italy License Plate, Panorama of Old Italian Fishing Village Beach in Old Province Coastal Charm Image, High Gloss Aluminum Novelty Plate, 6 X 12 Inches. zaeshe3536658 Italian License Plate, Designed Masks for Carnival of Venice Baroque Style Gondolas River Italy Landmark, High Gloss Aluminum Novelty Plate, 6 X 12 Inches.